We could all (or many) do better in getting better running and performance from our layouts. The art of taking photographs of your layout for pleasure. A 'might have been' French HO layout set in the Opal Coast area. As Walthers puts it '. . . a backscene adds miles to your layout. . . and some suggestions as how to go about it. An American HO layout based closely on an actual SP location. Chance & Hunt Ltd of Oldbury and Castleford. 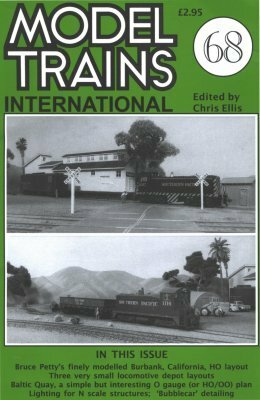 The story continued of the author's building of his first HO American layout (67/346), covering structures and scenics. A closer look at the author's well conceived and executed American San Fernando Valley HO layout. Smoke and illumination for a layouts structures. A simple and compact O shunting layout built at minimal expense, 12ft x 12in with plans for OO/HO. A tiny layout set in Chile in HO that fits into a shoebox. The authors SP/Frisco Transfer 3ft long HO layout becomes Helper Yard. Two small, 29in long, layouts built with public operation at shows in mind. Small changes and additions to improve the Hornby model.